Login to your Blogspot account and select " New Post ". Enter your Blog Title and Blog Post. Once you&apos;re done, use the mouse to highlight the sentence where you wish to insert your affiliate link. Then, click on the "link icon" button as shown in the example below. Insert your full affiliate link into the pop out box. Select "Ok". Click on "Preview" button to see a preview of your actual post which contains your affiliate URL. You should be able to click on your own affiliate link now inside the preview post. 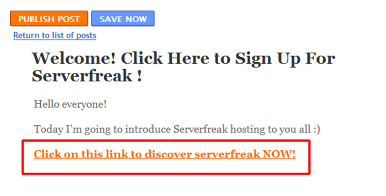 If it redirects to our serverfreak website, it means you have successfully placed your affiliate link into the blog post. Hit the "back" button on your internet browser to return to the preview page. Finally, click on "Publish Post".